Resurrected by Crichton E M Miller in 1997 the ancient working cross has been awarded two Patents. 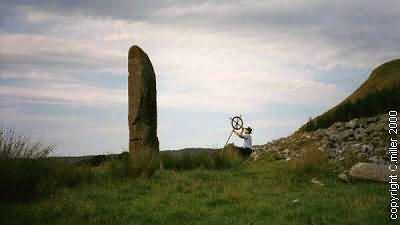 I am a Scottish born researcher and Company Director with an interest in prehistory. I have applied for a patent on a derivative of the Celtic cross. 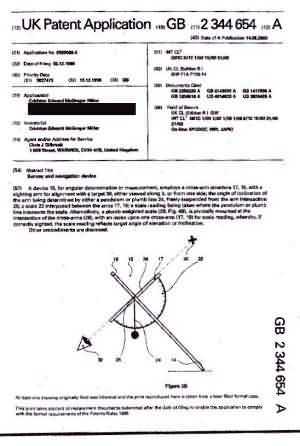 This application was published on the 14th of June 2000 under UK patent application GB 2 344 654 A. Despite intensive research by The Patent Office prior to publication, no instrument with its complete attributes has been discovered and its application was not found to be obvious. The Celtic cross, which is an ancient and sacred symbol, with which most people are familiar, appears to be a representation of an ancient instrument that was used by our ancestors as far back as Neolithic times. I believe that it was what the Ancient Egyptians and Phoenicians used to survey their buildings and navigate the oceans of the world. Despite the discovery of cocaine in some of the Egyptian Mummies, it has been argued, in august and academic circles, that it was impossible for them or the Phoenicians to have crossed the Atlantic in prehistory, because of their inability to navigate. Thor Heyderhal scotched the concept that their boats were incapable with his Ra expedition. I am about to collapse the final argument, by proving that they could navigate and had the instrument to do it. In 1997 Crichton E M Miller, a qualified navigator, made an astounding discovery that will change the way we see history and religion. This discovery is a revelation that reveals how our ancestors thought, their view on spirituality and their true capabilities. 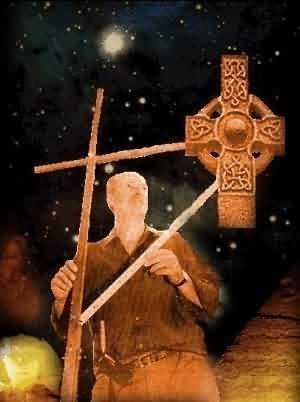 What Crichton discovered is that the Celtic cross was a mathematical measuring instrument that allows any observer, with sufficient knowledge, to find their geographical position anywhere in the world. You could say it was the world's first computer, certainly the working cross still is an instrument that can be used for remarkably accurate navigation, astronomy and surveying. The discovery came about in the winter of 1997 when I was trying to figure out what the Ancient Egyptians would have used to survey the great pyramid complex at Giza. All constructions, even ancient ones, require surveying before commencement of work. The incredible pyramid of Cheops and the Giza complex, which seems to embody the mathematical value of PI, would have to be accurately surveyed, as would all similar constructions, including stone circles such as Stonehenge, Avebury and Callanish in Scotland. Callanish is more than 5000 years old and built in the form of a Celtic cross - proof that this knowledge predates the Egyptian Pyramids. Through intensive and exhaustive experimentation, a belief in the intelligence of our ancestors and a refusal to believe in little green men as the designers, I discovered that the only appropriate instrument that could have been used by the architect, in the place of a theodolite, was a derivative of the cross, with the addition of a plumbline. This incredibly simple, yet complex instrument, has the potential to measure angles and inclinations to an accuracy of 1 minute of arc or 1/60th of a degree, depending on the size of the instrument used. This is an extraordinary accuracy for what appears to be only two pieces of wood, a scale and a plumbline. One of the most interesting but obscure abilities of the Cross is its capability to take sidereal measurements. 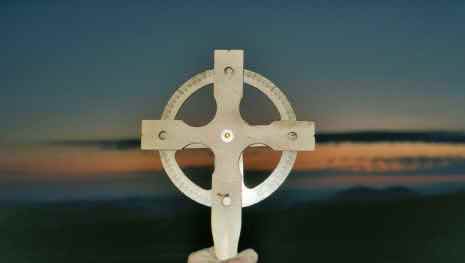 With my experience of navigation as a qualified Yachtmaster, I turned my experimentation to discover if the ancient mariners could find latitude and longitude with the cross. The experiments conducted, confirmed that the ancients could find their position anywhere on the Earth within 3 nautical miles with a hand held device. This discovery may help to prove that it was possible for sailors such as the Phoenicians to have made regular trading contact with the Americas in pre Columbian times. It also may explain the mysterious navigation skills of the Polynesians. This discovery also helps support pioneers of the theory of ancient intercontinental travel such as Thor Heyderhal with his Kon Tiki and Ra expeditions. I then went on to discover that this instrument was probably the basis of geometry, mathematics, ancient astronomy, map making and time keeping. That this instrument was used in combination with a detailed knowledge of astronomy and monthly star positions, ecliptic and zodiac observations so as to locate the position of any star at any time over a location on the earth's surface. Hence the saying "as in heaven so on earth". Furthermore, those observers were placed at strategic observatories throughout the known world to keep local time and traditions and to aid mariners and other travelers. Those travelers were able to find their longitude over short distances with the use of sand (hour) glasses in relation to local time between observatories (stone or wood henges in the north and pyramids in the lower latitudes) and world time kept at the old 0 degree meridian at Giza. I also believe that the henges were used to keep time and in fact were large astrolabes where stone balls were moved around the henge on a daily basis to represent the positions of the planets in relation to the sun and zodiac throughout the year. Ley (lay) lines, an ancient and modern navigation term, were used to lay the position line, or course, of one place in relation to another. This term is misconstrued to have magical or magnetic properties by modern cultists. It is in fact related to astro navigation and can be found in modern navigation manuals. The lay line from the Cape Verde Islands to the Caribbean Antilles, avoiding the Sargasso Sea is exactly 17 degrees North. To find this line an instrument that measures the declination of a star or the sun at azimuth would have to be used. I believe that this instrument was the Cross with a plumbline. I also believe that the quadrant, used in the 13th century was an inferior instrument in that it was incapable of sidereal measurements. I further believe that the Cross and the methods of its use, is one of the greatest treasures found by the famous Knights Templar, in their excavation of Solomon's Temple, during the Crusades. That this discovery led to a new style of architecture and the building of the Great Cathedrals in Europe, starting with Chartres in France. It may also have led to the greatest untold confidence trick in the last millennium played on Spain by Christopher Columbus and eventually leading to the destruction of the Amerindian civilizations. There is evidence that the Templars, to whom Columbus was associated, had been voyaging to the Americas for two hundred years before the official discovery. Using the cross as a navigation instrument. The Templar Archivist has already argued at Roslyn Chapel in Scotland, that William St Claire had voyaged to America before Columbus. The fact that the instrument actually works and can be demonstrated to fulfil a universal role in many functions, is vindication of my theories. What is truly amazing, is that no one has discovered this lost knowledge in modern times. The message in stone, wood, metals and art has been around for thousands of years, in full view of the public. Apart from the publication of the patent, I have been asked to publish and had accepted an academic 20,000-word paper, with 38 technical illustrations in the November 2000 issue of Fortean Studies. This article will be of great interest to those studying Egyptian constructions, but unfortunately can not be revealed until after publication comes out. In this paper I have outlined the methods used to tell the time and navigate with the combination of the cross, pyramids, stone circles and henges. I have also been asked to appear at the next Fortean Unconvention in London to speak about my discoveries. I have accepted that my name be put forward. I have appeared for 15 minutes in May 1999 on Teidi Television, following a lecture he gave to a conference on Mayan Culture in Tenerife. After gifting a working model of the Cross to Don Ajlehandro, Head Elder of forty-five Elders and spiritual leader of 6,000,000 Maya people. The only person allowed by the authorities to conduct ancient ceremonies on the Yucatan Pyramids. The last ceremony held at that time had in attendance every Amerindian Tribal Chief from Tierra del Feugo to Alaska. Don Ajlehandro said that it was his people's lost "Staff of Power" used to design pyramids and lost when the Conquistadors dispossessed them 500 years ago. He promised to show it to his Elders and place it for instruction of the young in the Maya Mystery Schools. A small article has been purchased by Practical Boatowner magazine and is due for publication showing how the instrument can be easily used as an emergency navigation backup in case of electronic navigation system failures. Apart from being a help to Archaeologists, in piecing together the unexplained mysteries and purposes of the pyramids of Egypt, Mexico, Peru, Stonehenge and other ancient constructions, I hope that my discovery will be an enlightenment to all seekers after the truth. That this discovery will enlighten all people about our past and inspire other researchers, helping to further our knowledge and understand the obscure culture of the ancients. I hope that I can find further sponsorship and assistance in providing the instrument to developing countries for a cheap and efficient method of surveying projects such as construction, road building and irrigation. I also hope, that this instrument may be used in the practical education of the young, so that they may gain a basic and interesting foundation of this ancient knowledge. That they may learn how our ancestors survived and learnt about astronomy, navigation, construction, mathematics, geometry and time keeping. How they went on to apply this knowledge, which is lost in the mists of time, to construct the ancient wonders of the world and achieve the seemingly impossible. I am presently compiling my research, with the aim of completing my first book by the spring of 2001. I, Crichton Edward McGregor Miller hereby assert and give notice of my right under section 77 of the Copyright Designs and Patent Act 1988 to be identified as the Author of the foregoing Article. In 1997 Crichton Miller made an astounding discovery that will change our concepts of the historical and religious past forever. Crichton’s background and life experiences play a fundamentally important part for this shattering revelation; he is a qualified yachtsman and navigator with an interest in ancient history and religions. Through the results of intensive research he proposes that the knowledge that formed our present system of beliefs and science was probably inherited from ancient mariners that sailed the oceans of the world in prehistory. He further proposes that in the cataclysms that followed the melting of the ice age 12500 years ago, which was responsible for the destruction of a huge part of the flora and fauna of our planet, the most likely humans to survive were those who were at sea. The reason for this is that any tsunami that is large enough to destroy Civilization would be more easily ridden out at sea, where the effect would more likely turn out to be a large swell on the surface of the ocean. Whereas, the effect on a coastline of a large tidal wave would be horrendous as the swell was turned into a giant breaking wave as it reached shallower depths. This breaking violent wave would annihilate all before it as it rushed up the beach. Evidence of any earlier civilizations are almost impossible to find as they are now below 300 feet of seawater making archaeology very difficult. However there is evidence of earlier civilizations; this evidence has been left in stone and myth for us to decipher. 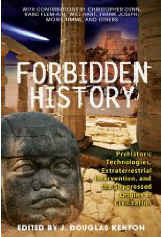 The author believes that these civilizations were maritime based, as we still are today. That these Ancient Sea peoples had developed a form of geometry and mathematics that was linked to astronomy and astrology as a result of the prime mover, survival. You have to know where you are at sea and to do that you must be able to find latitude and longitude. To find longitude you must know the time both locally and at a prime meridian. Today the prime meridian is at Greenwich but Crichton proposes that the original prime meridian is at Giza in Egypt from which all local times and distances were calculated. The result of this knowledge was that watch stations were developed throughout the world explaining the similarity over the millennia of structures and beliefs on a worldwide basis. This network has long been investigated and argued about, current academic belief expounds, in the face of lack of real evidence, that it is purely co incidental that there are such similarities. Many investigators and writers have commented on various pieces of evidence that could not be explained. These intrepid explorers have brought masses of information to the public attention. This information only deepens the sense of mystery and in some cases convinces a large section of the population into believing that aliens must have been involved in the achieving of the inexplicable. The author does not believe that aliens were involved, but rather that we are the aliens because we do not understand the way our ancestors thought and lived. In his book “The Golden Thread of Time” Crichton shows that, in comparison to the ancients, we have become very dualistic and have divorced ourselves from nature and the cosmos. Were this not so, we would be able to see what they left quite clearly and our civilisations would not be on the brink of disaster through conflict and the destruction of the environment. To prove his point, that we have difficulty in seeing clearly, he has been fortunate in discovering the instrument that the ancients used in prehistory to measure the stars and the planet on which we live. This instrument can tell the time, find latitude and longitude, measure the angles of the stars, predict the solstices and equinoxes and measure the precession of the equinoxes. The instrument can also find the ecliptic pole as well as the north and south poles, it can make maps and charts, design pyramids and henges and used in combination with these observers can record and predict the cycles of Nature and Time. The instrument is the machine of the Ancient Wise Ones that invented astrology and astronomy, it is also a religious icon hidden in the face of the public today. So what is this ancient icon that all humanity sees daily and does not recognize? It is on all Christian Churches and many gravestones; it is in literature and song and can be seen hanging round the necks of the faithful all over the world. The teachers of the Christian faith use it, kneel before it, wear it as part of their raiment and yet they do not seem to recognize it for what it is. Indeed the cross may be older than time and the greatest treasure ever left by our ancestors. The cross is a maritime treasure trove of wisdom and it is proposed that it may have been responsible for constructing the pyramids. The author has discovered the remnants of a cross that was hidden by the House of Amen, in the Great Pyramid of Khufu at Giza. This amazing cross is capable of measuring angles to an accuracy of three arc minutes showing that the cross may be more important than the pyramid since the pyramid could not exist without the cross. The cross appears to be much older than the pyramids since it is also responsible for the construction of Neolithic henges in Europe that predate the pyramids by thousands of years. The author has found out that this knowledge was rediscovered and kept secret by the Knight Templars and other secret societies throughout the Middle Ages. This great secret probably led to the destruction of the Amerindian Civilizations at the hands of the Conquistador when they found them measuring the stars with a form of cross which was called by the Maya their “Staff of Power”. It is possible that the Churches knew of its purpose during the last few centuries, but it seems that it is completely forgotten now. 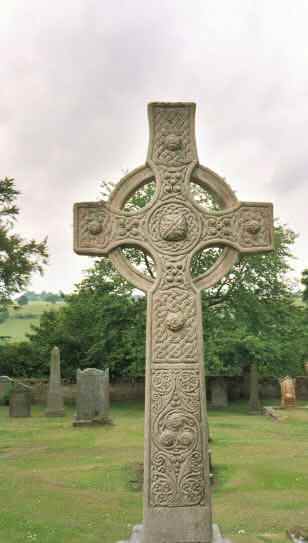 To show the comparison of this ancient technology, please look at the following photograph of a Celtic cross in the graveyard of Crichton Churchyard, near Roslyn Chapel in the Scottish borders. You will see that the cross forms an upright with cross bars set at 90 degrees to each other. 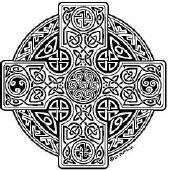 In the center of the cross is an object that looks like a hub and on the hub is hung a wheel. Now, our ancestors never designed things without purpose and the first purpose of using stone, as a medium is that of preservation. The second thing that they did was to incorporate important knowledge for their descendants. In keeping with the concept of “not casting pearls before swine”, they hid esoteric messages in anything that they carved so that the seeker may find what he or she was ready to understand. This can be ably demonstrated by the fabulous work of craft masons in the mediaeval cathedrals of Europe and of course, by much older constructions like the Great Pyramid. It is clear from observation that these masons carved a particular object that is obviously a wheel that is designed to rotate between cross bars on a hub. Why? In some of the older crosses, they incorporated a serpentine design around the wheel and also made the arms of the cross more wide at the outer edge than on the inner. Why? The answer to these questions only came to Crichton when he was experimenting with different methods to find out how the Egyptians could have surveyed the Great Pyramid and aligned it with the stars. All constructions need surveying first and the Great Pyramid was an enormous undertaking of civil engineering, so using the simplest of materials and the accepted mathematics of the time, Crichton assembled a theodolite, which could carry out the tasks required. With the addition of a scale rule and a plumbline, the instrument became a cross that was extremely accurate and fulfilled the set task and much more. Not long after this discovery, while carrying out further research, Crichton discovered the records of the Dixon Relics that were discovered in the north shaft of the Queens chamber in 1872. On further investigation, he also discovered that there were further relics still in the shaft and that these could be seen quite clearly in the photographs taken by Rudolph Gantenbrink in 1994 with his miniature Robot “Uphaut 2”. Crichton then set about assembling the relics in a logical format and the astounding result was a cross and plumbline of incredible accuracy. This artifact is capable of measuring all angles possible and coupled with sufficient astronomical knowledge it reveals all the mysteries of the ancients, how they kept time and measured the stars, sun, moon, planets and sailed the oceans of the world. But it goes further than that, exposing the Ancient’s fundamental spirituality and understanding of the world, nature and the universe. Crichton has discovered and published this rich source of understanding in his book “The Golden Thread of Time” ISBN 0-9541639-0-7. Many of these revelations have never been seen by the public before and are a must for those who seek truth and understanding. 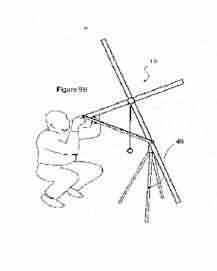 Crichton Miller applied for a patent on the cross and plumb line in 1998 and the patent was finally granted in November 2000 as an astronomical, surveying and navigational instrument by The British Patent Office. The result of this patent is the instrument you see below, as you can see it is a faithful representation of the Celtic cross in (Figure 1). This resurrected version of the cross is made so that modern people may understand it and compare it with the cross (in figure 1) or with any Celtic cross in any part of the world. 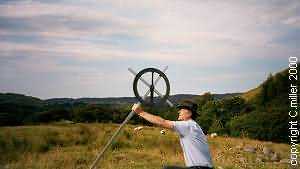 The working cross is marked in degrees round the edge and the wheel spins freely on a hub. The cross arms are perforated with viewing holes to allow the observer to read the angles and the bottom of the wheel is weighted so that it will always point to the center of the earth. The scale around the outer edge of the wheel runs from 0 degrees at the bottom to 90 degrees clockwise and anti clockwise so that horizontal measurements can be taken in any direction through the viewing holes. You can see the advantages of this instrument immediately when you look at the photograph below of an observer measuring the angle of the sun as it rises in the east at dawn. As the world spins round, the sun appears to rise from the horizon and its angle of ascent may be read from the scale directly. This angle changes, as the season’s progress throughout the year and time and place may be determined from the results of observing stars, planets and constellations. Crichton considers himself fortunate to have discovered the gift of the cross to pass on to his fellow man. The cross should be completely understood by as many as possible, for it was the foundation of the very roots of ancient Civilization, wisdom and understanding. Crichton believes that, in these current, dangerous and confused times, we could do well trying to understand the deeper knowledge of our ancestors and apply some of it to our present world. Crichton’s website www.crichtonmiller.com explains much more about his discoveries and his publishers also have a website www.pendulumpublishing.co.uk where a synopsis of his book “The Golden Thread of Time” can be read and the book ordered through a secure server. Lost in the thread of time, an incredible discovery has emerged from the dust of ages...Deep within the great pyramid is a secret that has remained hidden for over 4000 years. An ancient instrument designed to unlock mysteries that have baffled mankind for generations. The seal is broken. Within this film you will find the knowledge of the greatest Magicians that ever walked our planet. Crichton Miller in his intrepid journey to uncover the secrets of the past has stumbled upon a symbol that can only be called a great treasure. Through his tenacious spirit, Miller discovered a profound secret used for millennia, once lost and now revealed for the first time. The significance of this discovery will astound, surprise and bring humility to a world gone mad. This is the story of that search, of the discovery and the significance for mankind today. Crichton E.M. Miller specializes in seeking truth about our ancient history and spirituality, he is independent and detached from peer groups, materialism and religion. The Cross of Thoth reveals the hidden truth to mankind's most revered symbol. In 1997 Crichton E M Miller, a qualified navigator, made an astounding discovery that will change the way we see history and religion. This discovery is a revelation that reveals how our ancestors thought, their view on spirituality and their true capabilities. 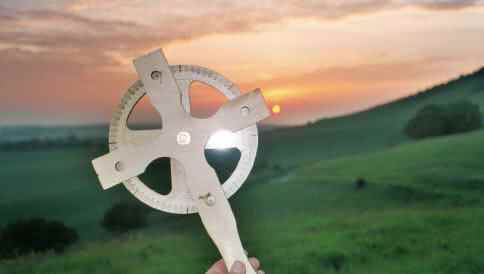 What Crichton discovered is that the Celtic cross was a mathematical measuring instrument that allows any observer, with sufficient knowledge, to find their geographical position anywhere in the world. You could say it was the world's first computer, certainly the working cross still is an instrument that can be used for remarkably accurate navigation, astronomy and surveying. Having made this discovery, Crichton was awarded a British Patent on the instrument in November 2000, proving that the cross is unique, that it actually works and is fully capable of achieving all the functions that he claims for it. Crichton went on to research the cross as an ancient instrument of navigation throughout history and discovered that there are actual artifacts of this instrument in the Great Pyramid of Khufu at Giza, Egypt. Thus proving that pyramids all over the world could not exist without the cross and therefore the cross is older than the pyramids. Crichton's excellent research shows how the Ancient Egyptian knowledge was derived from the skills of even more ancient sea going people that crossed the Atlantic and other oceans of the world long before Christopher Columbus. He goes on to show how they built and used a network of pyramids, henges and megaliths to find latitude, longitude and tell time with an accuracy beyond the comprehension of an uninitiated observer. Crichton reveals how and why the star cults were born, why the zodiac was invented, how the very concept of time was understood leading on to a enlightened and spiritual understanding of Nature and the Cosmos. Revealed to the public for the first time in thousands of years, this forgotten knowledge helps unravel the truth about our prehistoric past, the roots of our religions and the foundations of our societies. To read more of Crichton's work visit www.crichtonmiller.com. Crichton Miller is a man on a mission. His mission is, in my humble opinion, far more important than the Victorian search for the source of the Nile or the 60's race for space. It is more extravagant than the discovery of Tutankhamun's tomb and in my mind of more archaeological, scientific and historical importance than just about anything else you care to mention. To comprehend why I say this we need to just consider a few points. Firstly, how many of us agree that our Mother Earth is warming? How many of us are aware over the short lifetimes that we have had so far that the climate has been altering year after year? I know for myself, living in middle England that we no longer have the snowstorms I knew as a child; that Autumn is moving into Winter; Spring is coming sooner and Summer is stretching itself out like a lazy lion in the Sahara. In other parts of the globe huge waves crash onto idyllic shores and destroy the lives of thousands of humans; whirling tornadoes break and batter whole States in America and ice mountains the size of Ben Nevis collapse and crumble into the warming waters. 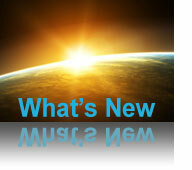 There is one thing that is sure - the world is changing around us as we live and breath. Whether you believe this change is man-made or by the power of the solar Father in the sky; whether you think the leaders of political parties and corporate empires are making the destruction of the world a reality or it is simply a cycle of nature - one thing overrides the argument - we cannot escape it now. And so, what to do, where to go, to whom do we turn? What will you hide away in your secure dug-out? Will you hoard tinned food and a tin opener? Or bottled water? And when they run out, what then? How will you hunt for food then? Should you carry a gun? And where will you get the bullets when all the shops have been removed by that passing ice-flow? You will need to travel. You will need to move fast and over long distances. You will need to know the weather cycles and the times of year and you will need to know your way around. How are you going to do this? You see what Crichton has stumbled upon may seem on first viewing to be fairly mundane. But, the closer you look and the more you find out, the more you become consumed in the intricacies, both exoteric and esoteric, of the workings of the artefact and the universe in general. This incredible discovery will one day change the world and help mankind to grow strong again. When we find ourselves in the stark reality of a nuclear winter; a solar consumed desert; a frozen wasteland - then and probably only then, will mankind remember this fight of Crichton Miller's to make known the secret tool of the ancients. The reason is quite simple. Only by using this device, which requires no electricity, gas, petrol or any power at all will we then, be able to discover where and when we are. This may seem incredibly trivial to us now, but imagine standing in the middle of a barren landscape of brilliant snow or sand and needing to find your way home. How will you do this without your GPS? A compass only points north and there are two issues with this. Firstly north may move magnetically, and this will cause chaos as we are already discovering with our modern electromagnetic systems. And secondly the compass cannot tell you the time of day, month or year. 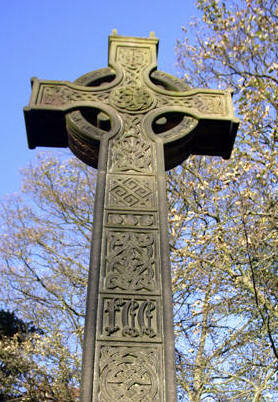 The wonderful Celtic Cross that Crichton re-discovered is all any future survivor will need. Read this book, keep it close to your heart; understand the workings of this cross, because one day, it may save your life. If you value your children's or grandchildren's lives then pass on the information and knowledge of the stars, let it be locked in their young minds and hearts. The future of humanity may again depend upon the wisdom of the ancients, who kept this knowledge for us locked subtly away. Crichton has re-discovered the incredible science and simplicity of our ancestors who too needed to escape the oncoming deluge over 12000 years ago. Did mankind recover again because he had the cross? I thought I would never hear myself say this to anybody - but take up the cross, it may very well be your saviour. Brendan the Navigator - new work of Crichton E M Miller suggesting that Saint Brendan the Navigator set sail for America from Ireland over 1,400 years ago (900 years before Christopher Columbus). A Link between Mesopotamia and Americas? Lost Civilizations, Secret Knowledge and Ancient Mysteries, quenches our thirst for insight into ancient times.